The kids have Spring break this week. Yesterday was spent cleaning the house so I figured I'd better do something fun with them today. 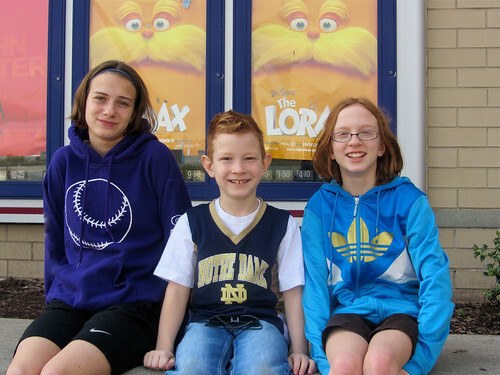 We picked up Mickey from work and went to see The Lorax. We all enjoyed the show. The musical opening was a pleasant surprise. I was a little bummed that Taylor Swift or Zac Efron didn't sing in the movie. I loved the trees in the movie. I wish there really was a tree that looked like a fuzzy lollipop. I would have a dozen in my yard.